A suicide bombing by so-called Islamic State militants the Iraqi city of Ramadi has killed two army commanders and three other people, officials say. Gen Abdel Rahman Abu Ragheef was deputy commander of operations in the strategically important province of Anbar, while Brig Safeen Abdel Majeed was a divisional commander. Islamic State (IS) controls Ramadi, 100km (60 miles) west of Baghdad. An Iraqi offensive to recapture the city has been making slow progress. The bombing happened in the Jerayshi area. The bomb went off as the army intercepted an explosives-laden vehicle which they believed was targeting them, Brig Gen Yahya Rasool told state TV. At least 10 others were wounded in the blast, he said. IS said it had carried out the attack. The military and the police are leading the battle to recapture Ramadi, supported by Shia militias, Sunni tribal fighters and US-led coalition air strikes. IS captured the city in May - one in a series of embarrassing defeats inflicted upon Iraqi forces over the last year - and thousands of civilians fled. The BBC's Jim Muir in Beirut says government forces have made little progress in their efforts to recapture the city, which remains firmly in the militants' hands. The deaths of the two senior army commanders have caused a stir in Baghdad - where numerous political figures paid tribute to them - and will do nothing to improve the morale of state forces, our correspondent says. US Defence Secretary Ashton Carter said in May that the rout of Iraqi troops in a matter of days when the city fell showed that they lacked the will to fight. Mr Carter told CNN the Iraqis had chosen to withdraw despite the fact that they "vastly outnumbered" IS forces. But Prime Minister Haider al-Abadi responded by saying he was surprised at the US defence secretary's comments and that Ramadi would soon be recaptured. 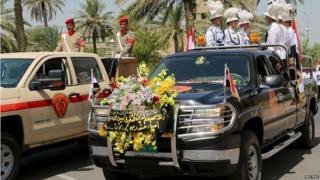 Mr Abadi has however cleared the way for a court martial of military commanders who abandoned their posts in the city.